It has been a while since I last wrote, having been busy with consulting work, keynote speaking and a family holiday in Europe. As I have been reflecting on new topics to write about, I have realised that there are a number of exciting ideas that need some air time, as I have rarely seen them discussed in association with digital health. I’ve decided to pull these together into a series of blog posts entitled “The Future of Healthcare”. I trust that they will, as ever, stir some debate. What Exactly Is Digital Health? Whilst I’m passionate that these topics are crucial to the future of healthcare, I’m not planning to cover them extensively as part of this series. I do a lot of work with clinical information systems. Systems for GPs (Primary Care Physicians), hospital doctors, allied health professionals, specialists, nurses and many others. The vast majority of them have one thing in common – they’re not very good. Issues with user experience, lack of clinical coding, poorly designed workflow, dated architecture and many other problems abound. Medications are important, and save many lives. But they are rarely long-term root cause solutions to complex issues. The central focus on conditions and medications within medical records subtly reinforces the incorrect idea that we are addressing the root causes of a patient’s health issues. What is missing is a more holistic plan to not only address a problem with medication, but to move a patient beyond their immediate symptoms and into wellness. For example, what other actions (beyond medication) does the patient need to take to bring about better health? How do exercise, sleep and nutrition play a vital role in achieving that goal? And what is the goal? What will determine when improvement has been achieved? Records focused around problems and medications also cement a medical paradigm that looks backward in time. What conditions does the patient have and how are we medicating them? What was done and when? Sadly, there is rarely much evaluation of the efficacy of particular interventions. As a patient I have rarely been asked how well a prescribed medication is working for me. Clinical information systems rarely force the capture of structured outcome information (either from health provider or patient) that can then be used to refine a treatment plan. Beyond sickness lies wellness. The goal of treating sickness should surely be to become well, not just to stop being sick. And yet our medical records largely focus on the tactical, medication related steps that address the symptoms of illness. What would a true health record look like? As I have reflected on this problem over the last couple of years, I have come to the conclusion that at the heart of every health record should be a care plan. A care plan that allows quantifiable goals to be defined, measured and updated on an ongoing basis. Goals that can be assigned actions so that there is a clear picture of what can be done towards achieving them. Actions that can be given to patients so that they are clear what they need to do. And outcomes that can be reported against those goals on a regular basis, e.g. how am I going against this goal? The Care Plan stores information about the patient, the health provider(s) managing the plan and the health conditions / problems being treated. A series of Goals can be defined as part of the Care Plan, e.g. bringing BMI below 30, or bringing blood glucose levels within a normal range. A number of Actions can be defined that guide a patient with regard to what they need to do to achieve the Goals. An Action can relate to multiple Goals. Consumer Health Observations are consumer recorded vital signs (e.g. weight, blood pressure, blood glucose, etc.) that can be recorded against a Goal, providing a history of achievement towards a particular Goal. Consumer Health Observations can also show that a patient is deteriorating or moving further away from a Goal. Clinical Measurements are clinically record vital signs that can be recorded against a Goal, providing a history of achievement towards a particular Goal. By taking a more structured approach to care plans, new models of care can be designed that support safe and efficient remote management of patients. By carefully defining best practice goals for a particular health condition / problem, patients can (remotely from the health provider) record consumer health observations, sharing their progress (or lack thereof) through digital channels with their health provider(s). In the event that a patient is progressing well towards a goal, they may not require any intervention (particularly in the case of chronic condition) and can continue to be safely and efficiently monitored remotely. However, if a patient is deteriorating, or not tracking within the safe boundaries as defined by the care plan, health provider(s) can be alerted digitally, allowing them to decide whether a patient needs an urgent or scheduled face-to-face intervention. Very eloquently put. I wholeheartedly agree with your premise. 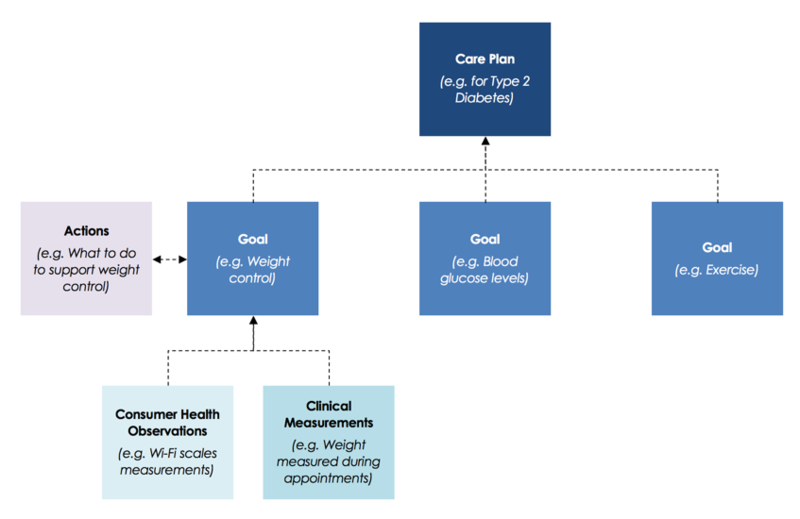 – The overall Care Plan should be for the patient, not a condition (as you seem to indicate in your diagram when you start the care plan with diabetes). This is especially so because we have so many multi-morbid patients. Each patient’s care plan should probably contain plans for their multiple conditions. – The diagram would be best served to be multi-dimensional (if it was possible to adequately reflect this on paper) – each patient’s multiple problem care plans would each have multiple actions and goals, and both the actions and the goals may relate to multiple care plan problems. Some fancy multi-linked object structure for the elements “care plan problems”, “actions” and “goals” would then allow the record to be represented to the consumer as eg an Action List, or a Goals List, or a Problems List. – If one presented each medication a patient was taking as an Action, then the medications would be able to be intertwined in this care plan paradigm and be properly integrated into the care plan – this would enable the consumer to have two useful bits of medication information, in addition to all the other great information in the plan – a) a single medication list, and b) clear understanding of the relationship between their medications and the problems they are being used for. Would love to chat about this sometime, and let you know some of the work we have been involved in similarly to yours. The challenge is how to inspire the patient to be engaged .